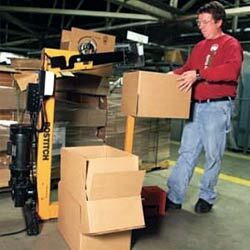 We offer a wide range of staplers for corrugated carton boxes and carton packaging. We sell Bostitch, Josef Kihlberg, and Salco staplers and staples. Carton staplers are available for C or A type carton staples ( 1-1/4", 1-3/8" crowns). Pneumatic Plier staplers are available for the Josef Kihlberg 590, 777, or 779 carton staples, as well as the Bostitch SB103020 and SB5019. For closing the tops of a variety of corrugated cartons, quickly and securely. Fast and efficient top carton closing when a source of compressed air is not available or desirable. Air-operated roll (coil) staplers. Ideal for high volume sealing of containers entirely from the outside & top closing of virtually all types of corrugated containers. To build corrugated boxes from their flat knock-down state. Foot operated or pneumatic to suit every production corrugated packaging need. Trays, corners and edges are best joined with side-arm staplers. 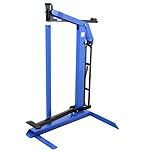 Pneumatic and foot operated versions available. Pneumatic C-arm plier staplers for specialized or difficult access box sealing applications. For demanding tri-wall corrugated box stapling applications. May be used for closing tops or bottoms of very thick corrugated from 5/8" to 7/8" in thickness. 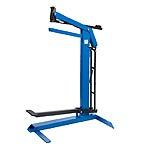 Specifically designed and engineered for stapling corrugated boxes, trays, or lids to wood pallets or frames. This ensures strong and robust transport durability and security. 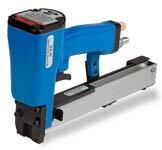 The SPH-2432 is a special stapler for securing corrugated cartons to wood or composite pallets or skids. Uses wide-crown staples for a strong and durable attachment between corrugated and pallet or skid. 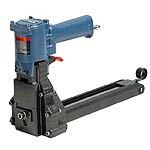 The Roll-feed Stapling Heads are available to fit virtually any semi or fully automated corrugated case erector application.